Little Basses Reef Lighthouse is an active offshore lighthouse at the southern end of Sri Lanka and it is operated and maintained by the Sri Lanka Navy. It is located on a reef called Kuda Ravana Kotuwa (Fort of Little Ravana), but when the British invaded Ceylon they named it Little Basses (fourteen km off the coast of Yala National Park and north east of the Great Basses Reef Lighthouse. The two Basses lighthouses are among the most famous offshore lighthouses of Asia. 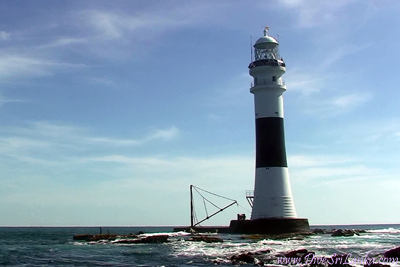 It withstood the force of a tsunami in 2004 with only modest damage; it was repaired with assistance from the UK lighthouse authorities Trinity House and The Northern Lighthouse Board. The lighthouse is close to Daedalus Rock, site of the sinking of HMS Daedalus (1811). Little Basses was one of a limited number of lighthouses that were designed to house the large Hyperradiant Fresnel lenses that became available at the end of the 19th century. Four of these lenses were used in Sri Lankan lights, all made by Chance Brothers in England. ^ "LIFE OF WILLIAM DOUGLASS M.INST.C.E." (PDF). uslhs.org. This page was last edited on 4 March 2017, at 14:23 (UTC).